home » archive "culinary dictionary"
Avocado (Persea americana) – laurel tree family . Plant comes from Central America . 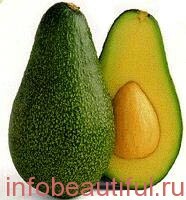 Avocado is grown in the tropics, detailed article for gardeners We grow an avocado from a stone. edible fruits, delicious, hrushevydnыe, with bone inside. The pulp is rich in fats. Avocado is an important component of the famous guacamole (avocado mixture frayed, tomatoes, pepper), which is used as a paste for bread or as a sauce. The peoples of Asia use avocado as a dessert. Our compatriots in the United States called the avocado "green bacon". How to meet and marry the man of her dreams, and, how to have a life, you want, and happiness, that you deserve! Secrets of cooking hair mask at home by the best beauticians.